Building Information Modeling (BIM) Carts from BHS house full-service mobile offices for on-site administration for construction projects. They allow users to view digital building plans in the field, even in outdoor environments. This portable steel job box mounts flat screen monitors up to 55”, with secure cabinets for computer towers and a pullout keyboard tray. Locking swivel casters create a highly mobile display/work center for Building Information Modeling (BIM) objects, Gantt charts, and other software tools. Route power through a rear 15A power inlet to two duplex GFCI and four additional outlets. Ergonomically placed push/pull handles improve maneuverability. 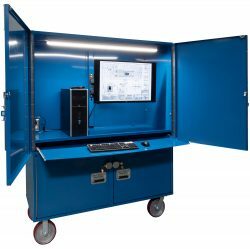 A powder-coating formulated for industrial settings protects computers and keeps the Building Information Modeling Cart safe from impacts, rust, and chemical corrosion. Building Information Modeling Carts are particularly prized by electricians for use during complex installation jobs. They allow immediate access to digital tools to ensure that the job is completed accurately, efficiently, and safely. Custom models are available to accommodate additional equipment and unique features. Call 1.800.BHS.9500 to learn more about the Building Information Modeling Carts and other warehouse solutions from BHS.